The rock art I chose to be display here, on the Elders lounge Mural is from the Sydney basin. The animals are found inland but were also along the coast in the early days. The fish are from around saltwater country and the Goanna should be there somewhere as this is the totem for the Gadigal people. 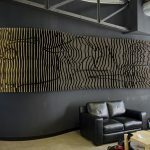 Mana Ngurang is a 7m-long eco-friendly plywood “mural” mounted on a curved black painted wall, in the Elders Lounge on the first floor of the Redfern Community Centre. 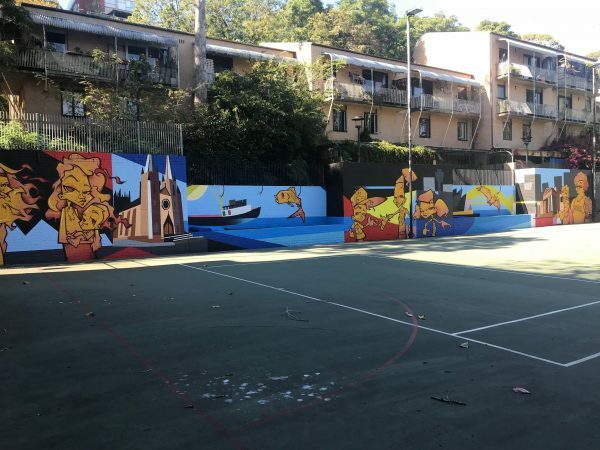 Commissioned by the Redfern Community Centre, the project was developed by Aboriginal artist and designer Nicole Monks in collaboration with Gadigal elder and artist Charles ‘Chicka’ Madden and architect Dirk Anderson from Urban Future Organisation. 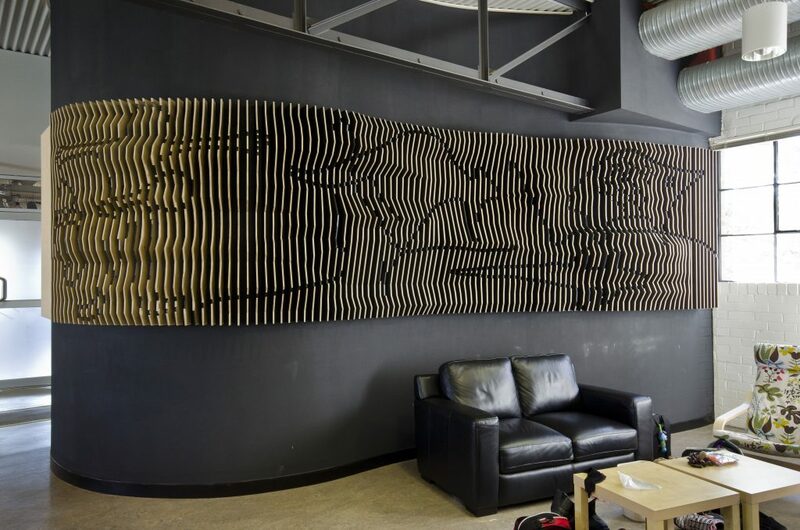 The mural is made up of approximately one hundred sections of plywood, fixed vertically to the wall by their edges. 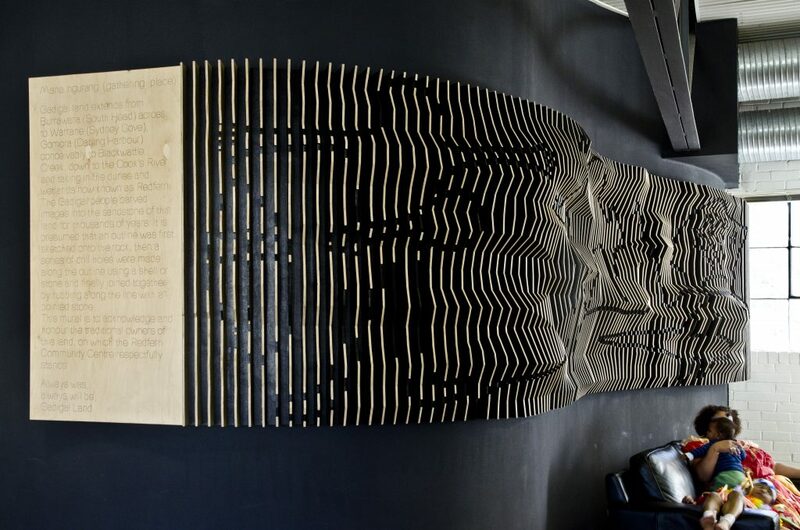 Carved to slightly different shapes and depths, the plywood pieces create a vibrant three-dimensional effect. 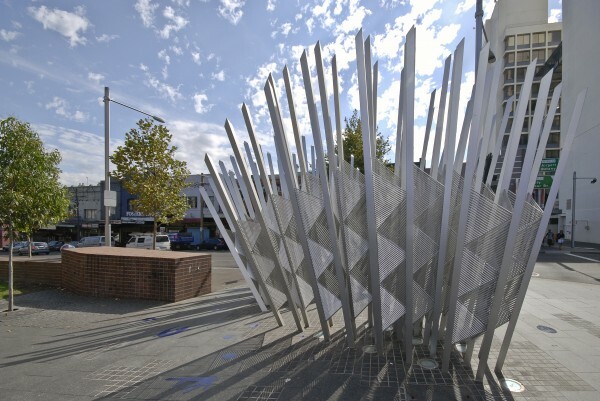 The artwork, based on Madden’s design and community consultation, represents the traditional lands of the Gadigal people within which Redfern is located. Inspired by the style of Aboriginal rock art found within the Sydney basin the work depicts human figures and animals that once inhabited the local area. 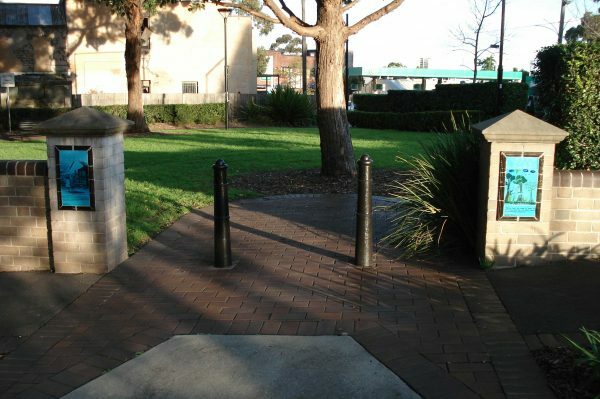 As well as respecting the traditional owners of the land, this artwork is intended to create harmony between cultures. 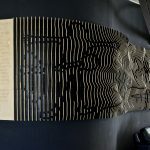 The fabrication and installation of the artwork was made possible with the support of project partners: Murobond, Global Ventures Australia and Keystone Acoustics. Uncle Charles ‘Chicka’ Madden is a respected Sydney Elder of the Gadigal people. He has lived within the inner-city area of Sydney for most of his life, serving the Aboriginal community as Director of the Aboriginal Medical Service, Secretary of the Metropolitan Local Aboriginal Land Council, Director of the Aboriginal Hostels NSW and is a life member of the Redfern All Blacks. 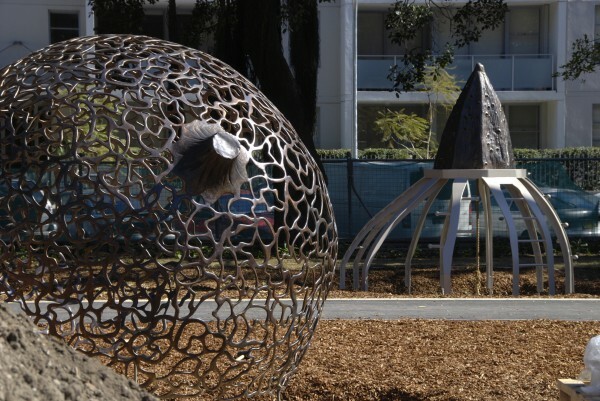 As well as an active community leader, Uncle Chicka is an important artist who has created a number of ceramic sculptures and paintings inspired by his Gadigal country. Nicole Monks is a trans-disciplinary artist of Yamatji Wajarri, Dutch and English heritage. In addition to her solo practice, Nicole is well known for her success as a collaborative artist and as founder of blackandwhite creative. Dirk Anderson is an architect and director of the Sydney branch of Urban Future Organization (UFO), a collective of self-organised architectural practices who share common design strategies. His work has been exhibited at galleries internationally including the Venice Biennale of Architecture. 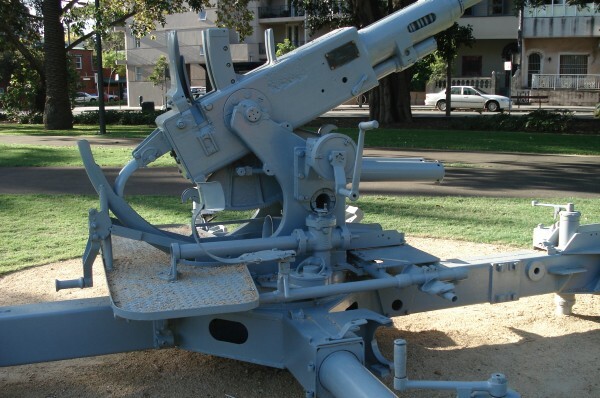 “Gadigal land extends from Burrawara (South Head) across to Warrane (Sydney Cove), Gomora (Darling Harbour) conceivably to Blackwattle Creek, down to the Cook’s River and taking in the dunes and wetlands now known as Redfern. The Gadigal people carved images into the sandstone of this land for thousands of years. It is presumed that an outline was first sketched onto the rock, then a series of drill holes were made along the outline using a shell or stone and finally joined together by rubbing along the line with a pointed stone. 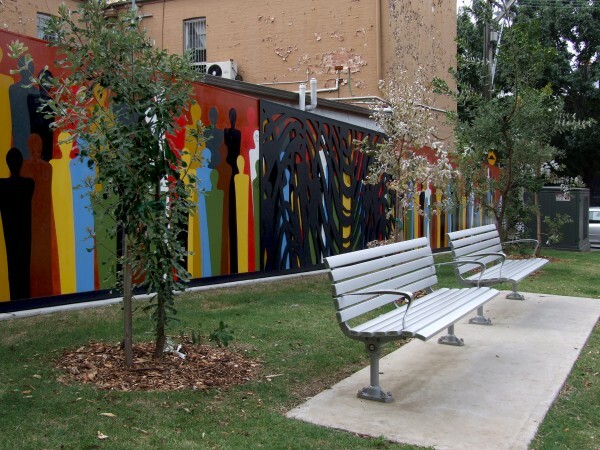 This mural is to acknowledge and honour the traditional owners of this land, on which the Redfern Community Centre respectfully stands.